Our banks have grown out of control. They have every incentive in normal times to expand lending to grow profits. They were given the ability to gorge on this lending way beyond normalcy through the ability to create debt independent of deposits or anything else, through the removal of all watchdogs, and through fractional reserve lending. They exist not only in the US, but in almost all countries in quite the "non-zero sum fashion". They are now bursting at the seams due to their enormous size. We are not primarily a fiat economy driven by central bank actions. We are primarily a PRIVATE CREDIT economy, driven by the desire and the ability of banks to create debt, with a fiat economy on the side. This is not right. We have become overly reliant on debt. Our politicians and our business leaders are trying to convince us that more debt is the solution. They have it completely backwards. Debt is the problem. It is why we are in this situation to begin with. There is nothing wrong with a reasonable amount of debt. Our debt load is completely unreasonable - it is simply not sustainable, even in a purely utilitarian sense. 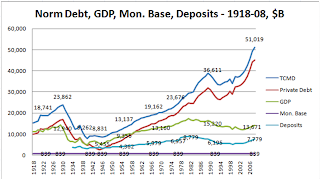 There is no economy like ours where debt originated purely for consumption is as prevalent, or as accepted. It's not right on many levels. What are the empirical parameters of this system? 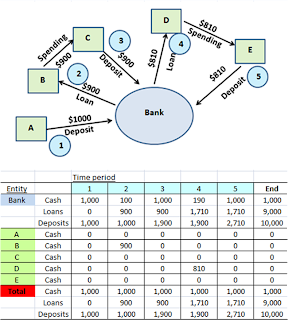 What are the theoretical properties of a pure fractional reserve lending system? Why is plain vanilla Fractional Reserve Lending an unsustainable Ponzi scheme? What are the EMPIRICAL properties of a pure fractional reserve lending system? The dynamics of our system imply that we are a *Private Credit System* first and foremost - that Private Credit Growth, freely originated by banks, has been the primary driver of the money supply and our economy. A fractional reserve system with very low reserve requirements is extremely unstable, but we are even worse. Debt growth seems to be its own beast. Our credit bubble is home-spun, not a zero sum game versus China. China has lent us $1T, while our debt is $52T. We created that leverage within our own banking system, and every banking system can do the same. It seems apparent that the US, Europe, the UK and Australia most definitely created their own credit bubbles. This is a worldwide phenomenon that cannot be "taken out on the foreigners". Private debt is orders of magnitude bigger, and a bigger factor than, both Government Debt (government stimulus) and the Monetary Base (Fed stimulus). Again, we are first and foremost a Private Credit System. Fractional reserve lending systems w/short term capitalism have the ability and incentive to create more debt than society could ever support, and we have clearly gone beyond that point. The fact that debt growth has steadily been creating ever smaller amounts of GDP growth strongly support the notion that we are now simply borrowing the interest on our unsustainable debt. Our society cannot support this much debt. When we can no longer borrow, this dynamic will work in reverse. The vestiges of any conservatism in our FRL system have been abused, goaded by de-regulation and short term capitalism. Most reserve requirements have been scrapped. And consumers have been tricked into thinking this is a good thing, b/c they can get a 2% interest rate (even though it has contributed to the bankruptcy of our society). Deposits in total are an accounting fiction, to the extent that they are a byproduct of a small amount of base money being lent and re-lent over and over again. To the extent the loans must be written off, deposits will get withdrawn as well. However this will expose the small cushion of actual cash in our society, supporting both deposits and loans. It is game over when market participants realize we simply cannot service a debt as large as ours. Reasonable estimates imply we would have to work off approximately $40T of debt. Our GDP without the positive effect of debt is around $11T - just imagine if we had to shrink that down to manage a debt contraction of $40T. It would cascade completely out of control. But again, this is a process that cannot be avoided. Our economy has become overly reliant on consumption driven by unsustainably large volumes of debt. I would add a fourth - Output. Output is spending. It is what we call GDP. We think about GDP a lot here, and spending (and income) are what drive our economy. Important variable! In the table above, GDP goes up when money is spent, but not at any other time. (1), (2), (3), (4) and (5) would show cumulative GDP of $0, $900, $900, $1710, $1710. Note how an initial $1000 was able to create $9000 of GDP simply due to credit growth and a zero savings rate. These are the parameters we should be thinking about. These are some of the properties of a fractional reserve lending system, as they pertain to the 4 variables identified above. All are evident from that simple example. 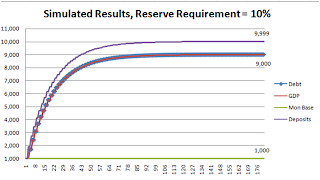 [Cash / Deposits] >= Reserve Requirement, always. [$ Loan Growth] = [$ GDP Growth], always. Cash injection comes 1st, Credit growth comes 2nd. Loan losses dramatically disrupt bank functioning w/ reasonably small reserve ratios. These are simple enough to see, and are intuitively appealing. Why is plain vanilla Fractional Reserve Lending with low reserve requirements an unsustainable Ponzi scheme? That deposits in total are an accounting fiction, to the extent that they are a byproduct of a small amount of base money being lent and re-lent over and over again (see "cash" in above schema, compared to "deposits"). By this I mean that while everyone believes their deposits represent wealth, it is only as real as everyone's desire to NOT monetize it in any large amount at any point in time. All that everyone, at any point of time, can monetize is the base money, which can be (and is now) a small fraction of total deposits. If even a fraction of depositors were to withdraw, the whole system would go down. That fractional reserve lending beyond a certain point is predicated on perpetual growth, which makes it in some ways a big Ponzi scheme. Mathematically, a Fractional Reserve Lending ('FRL') system can create more debt than the ability of output to support that debt. Once output is no longer sufficient to make good on the interest on loans that were created into existence by banks (as it is now), then the system can only borrow the difference as GDP gets squelched until people realize the insolvency of the system. Even the vestiges of our FRL system have been abused, goaded by de-regulation and short term capitalism. The original reserve requirement associated with deposits was 10%. That is, banks needed to set aside 10% of the cash given to them as a buffer again loss. That is still true for "demand deposits". However savings accounts and money markets have ZERO reserve requirement, and are lent out in FULL. Checking accounts USED to have 10% reserves. However this was removed under Greenspan in 1994. Legislation allowed these accounts to be "swept" into accounts that require NO reserve requirement (source, source). The banking system has been trying to squeeze every last drop of profits out of their deposits (and give a trickle to depositors via higher interest rates), but this has had the effect of horribly under-reserving the banks vis a vis their loan books. Even small loan losses are enough to bankrupt the banking system, if lending is not able to grow. When the economy is growing, this is not a problem. In fact, when things are going well all these loans reinforce the good times. The problem is that this structure leaves the system horribly vulnerable to defaults. We just finished a debt binge on an unproductive asset bubble and consumption. There is no reason why we need to stop with the theory. We have all of this data for the US. The theory behind the choice of these figures was explained in "Monetary base is "cash"". GDP (green line) kept up with Private Debt (red line) until around 1960, when private debt began shooting well north of GDP. 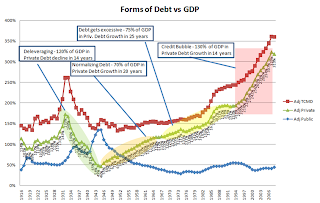 Then in 1980, GDP markedly diverged below debt (especially evident in the adjusted base graph). 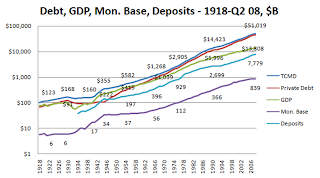 Deposits are always supposed to greater than debt, but as can be seen, Deposits were less than Private Debt in only 3 years - 1943, 1944 and 1945. Monetary Base (cash) is small compared to Deposits, but piddling compared to Private Debt. These results heavily call into question the hypothesis that we are purely on a fractional reserve lending system on 2 fronts. Debt growth is way too fast relative to GDP growth recently (when their growth in $ terms is supposed to be equal). We can look at this in a few ways - (1) Ratio of Debt / GDP ; (2) Change in Debt / Change in GDP. GDP, as noted earlier, is a proxy for the income of our nation. This chart, then, shows that an ever increasing amount of debt is being supported by the income of our country. This should cause a drag on the ability of GDP to grow. Before we used to get full "bang for the buck" - Debt growth had almost a 1-for-1 effect on GDP. Over time, debt continued to grow, but its impact on GDP has shrunk. While the graph has variations over individual time periods due to the business cycle, we have basially gone from 100% in the last 1940's to 20% in the 2000's. The original 1-for-1 relationship b/w debt and GDP growth is supportive of what we would theoretically expect. The lack of "high" in later periods is supportive of the notion that we are now buckling under the weight of our collective debt load. As noted above and elsewhere, lending beyond a certain limit requires Ponzi-like perpetual growth. In the absence of miraculous output growth, we must be able to continually borrow the interest on the incremental debt. This graph strongly suggests we are borrowing ever increasing amounts of interest on a growing mountain of unsustainable incremental debt. 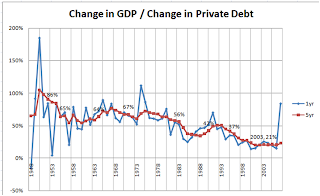 Private Debt / Deposits had been 250% or below from 1934 to 1980 or so. Then it spiked up to 580%. This supports the idea that we *truly* began our debt binge in 1980. In a pure fractional reserve lending system, how could such growth be possible? The same amount of deposits somehow translated into a heck of a lot more loans. Banks began lending before they actually received deposits or base money injections. Banks began selling their loans via the securitization market. The securitization model is extremely perverse from a macro perspective. It has pumped a lot of loans into the system that could not be supported by the banks alone. It has allowed for a far greater accumulation of debt within our country than would have ever been possible in a traditional banking system. It removed due diligence and loan underwriting standards. Debt's size vis a vis deposits strongly supports the notion that our system has primarily been driven by DEBT. 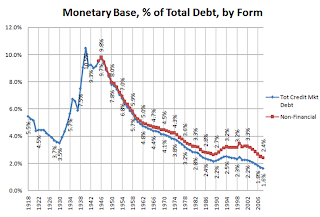 This is a graph of Monetary Base as a % of Deposits. This is how much our society is holding aside in actual cash, supporting our deposits. We began stripping away "buffer" after WW2. We are at the bottom of the range, at 11% right now. As low as we've ever been. 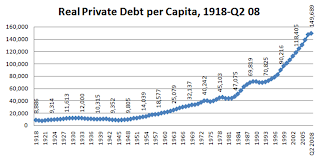 From 1918 to 1948, real per capita Private Debt was below $10k per person. From 1948 to 1978 we went from ~$10k per person to $45k. From 1978 to 2008 we went from $45k to $150k. This is simply huge. It is one thing to be on an FRL system and have total debt per person at a manageable level of say $30k even. Median household income is $43k, when there are around 120k households in this country. This implies a median debt per household of $380k. Does this sound normal to you? This is the problem with an FRL system in a short term capitalist society, on a credit system with a fiat subsystem. It has every ability and every desire to create this much debt, and doesn't know when to stop. This is how much cash is underlying the loans in this country. Cash, or monetary base, is the "input", and loans are the "output". The magnitude of the output vis a vis the input is a function of how aggressive the banks are. We are at best half of where this figure should be. Loans are simply orders of magnitude bigger than they have ever been, relative to the underlying monetary base of our society. We passed the pre-Great Depression debt level in around 1975. Sounds about right. Everything is triangulating to a similar range. I agree. G. Edward Griffin makes the point very well in his book, [i]The Creature From Jekyll Island[/i]. He basically says that with any fiat currency, whether a value based or debt based one, that no human being has the restraint to pull the lever of the printing press "only this one time". Nobody on the planet is ever capable of exercising any restraint in such a system. Even the most well meaning cannot do so. They will ALWAYS go crazy with it. They will ALWAYS find some "emergency" to justify it. I prefer hard money, not because there's anything terribly special about precious metals. But simply because they act as a check against human nature. They prohibit you from getting something from nothing. And that's the beauty of it. I hear ya Pontius, if the logic is that you can never do something like that halfway. That eventually, over a long enough time period, you are bound to give up conservatism and just go nuts. I agree with Niall Ferguson that this is indeed the Age of Leverage. I would argue that money lent into existence, is ALWAYS a killer. I do not believe a debt-based money system is ever sustainable. Money should be spent into existence, not borrowed into existence. Money should be a representation of value, not a representation of a liability. Ideally, I'd prefer a hard money system, like gold or silver. Money lent into existence through loans are an absolute killer when the quantities are large enough. For the layman, watch the 47 minute documentary titled [i]Money As Debt[/i]. It presents the theoretical basis for debt creation in terms that are easy to understand. Reggie, I think these two posts on debt are absolutely superb. Thank you very much for posting them. Warrants are awful. In the Chrysler case, the government almost wound up ripping the warrants up after Chrysler turned around. Our leaders really don't give a sh1t about the taxpayers. Pretty sad. NY Post reports the US Treasury Department is ready to accept warrants instead of common shares in exchange for billions of dollars in financial aid is order to keep Uncle Sam out of the board room - and thus keep banks from being nationalized, sources said. The move to accept warrants - the right to purchase shares in the future at a pre-determined price - will play out next week as Treasury gets results from the first round of its crucial stress tests. In addition to keeping banks from being nationalized, the move to accept warrants in exchange for the much-needed federal cash, the recently devised strategy will boost banks' tangible common equity ratios, which appears to the financial standard Treasury will use instead of Tier-1 capital. Banks that survive the first round but cannot remain viable during the more strenuous dire depressionary landscape will receive capital through preferred shares to be converted to common shares should the bank need to boost its Tier 1 capital ratio, according to sources inside Treasury.